For improved NFT lettuce and herb production, we recommene 612HL Herb & Lettuce System. This beginner package is perfect for tackling the hands-on experience you need for continuous hydroponic growth. All components have been constructed or chosen to enhance their efficiency, energy usage, water usage, and longevity. The GroClean NFT channels help conserve natural resources and reduce carbon dioxide emissions with their construction of FDA approved HDPE plastic. Included subscription to AmHydro Pro™ Grower Support gives you premium access to our private documents and commercial support team. This means you've got the resources at your disposal to troubleshoot any problems that might arise. 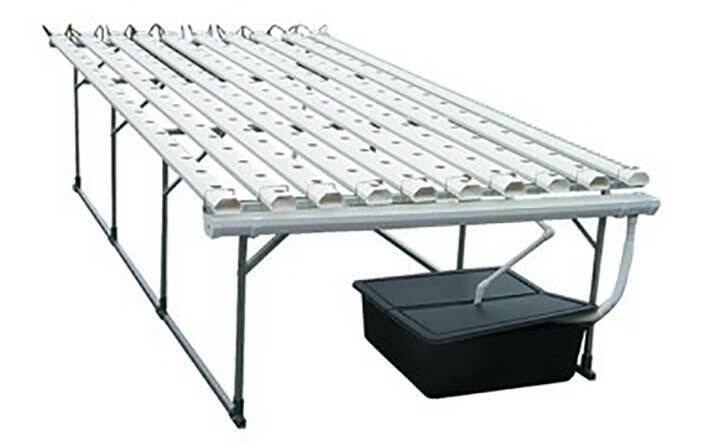 The 612HL System allows you to acquire hands-on experience with hydroponics by actually growing in the system. Take your produce to potential markets, put it in their hands and give them the taste test. In this way, they will know you're serious. This will give you a solid indication of how much they'll be able to buy from you so you will know how large an operation with which to begin. As an herb/lettuce system, it is capable of growing 72 heads of lettuce or basil bunches per week. If a large commercial system is purchased, we will credit the purchase of the 612HL System to your order.